Renowned ‘Wednesday Night Prayer Meeting: Rejoice’ A Night Of Worship & Song Premieres In Select Theatres Nationwide Tonight! 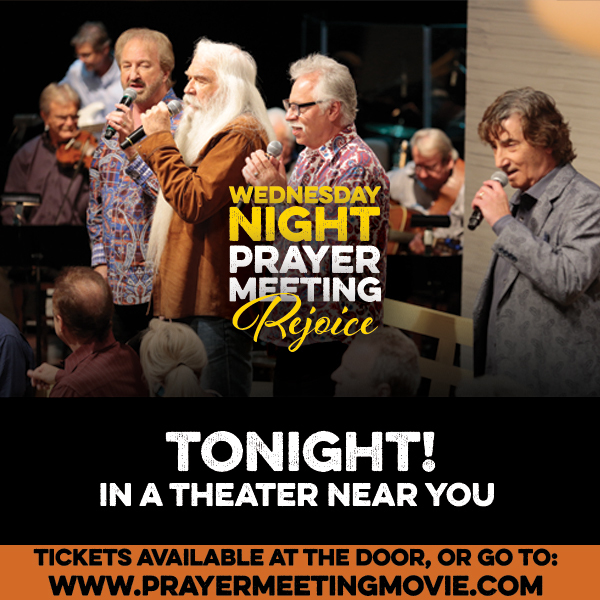 Gabriel Communications, creators of “Larry’s Country Diner,” in association with KAOS Connect and Screenvision Media present the first-ever movie premiere of ‘Wednesday Night Prayer Meeting: Rejoice!’ in select theatres nationwide tonight! This let-your-hair-down style of worship will feature interviews and performances by Ricky Skaggs, Oak Ridge Boys, Larry Gatlin and The Gatlin Brothers, Gene Watson, John Conlee, Teea Goans, Jimmy Fortune and the Isaacs in a 90 minute theatre event celebration. In addition to the unique artist performances and storytelling, fans will get a behind the scenes, in-depth look directly from the creator of the “Wednesday Night Prayer Meeting” and Gabriel Communications CEO, Larry Black as he shares his personal and powerful connection to this movie event. This special theatre worship event will be shown in more than 225 movie theatres across the country for only one night, Wednesday, September 27th. Screenvision Media is proud to bring to movie theatres this family friendly, heart-warming celebration of intimate stories and performances by so many legendary country music artists of our time. ‘Wednesday Night Prayer Meeting: Rejoice’, is one not to be missed,” said Bernadette McCabe, Senior Vice President, Business Strategy, Screenvision Media. Tickets and additional information are available at: www.prayermeetingmovie.com.